I have seen on countless conservative websites the latest employment figures, with the right-wing authors touting GOP financial prowess over what they classify as Democratic ineptitude, but if you look at more then the just the final tally you would see numbers that come right from the conservative wish-list - public-sector jobs dropped while private sector jobs increased, although not enough to offset the government layoffs and present a positive jobs number. 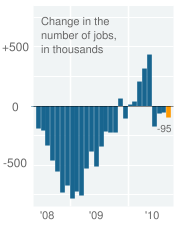 Government job losses led the declines in September. A net total of 159,000 public-sector jobs were eliminated. Local governments cut 76,000 jobs last month, most of them teachers. That's the largest cut by local governments in 28 years. States cut 7,000 jobs. The rest were census jobs. While these numbers aren't exactly great news, Republicans - especially those who advocate smaller government - should be pleased with the results, but you probably won't hear them say the economy is doing great, or even good - especially this close to an election.